Begonias are such stalwarts of the summer garden that they are often overlooked, even sniffed at, by so-called fashionable gardeners. I’m not attracted by the enormous, dinner-plate sized blooms of most tuberous begonias, but find single flowered hybrids essential for colour in my partially-shaded garden. They do not demand day-long sun and look all the better for it, flowering better when the weather is warm, sulking slightly during cool spells. In my begonia armoury (or should that be ‘amoury’?) are Begonia ‘Million Kisses Devotion’, B. ‘Million Kisses Passion’ and B. ‘Firewings Orange’. 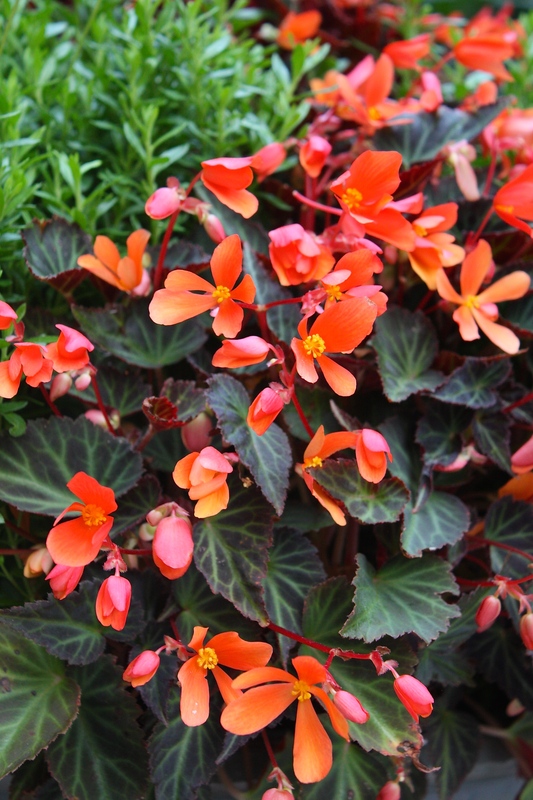 But, after their flames have died down, I am always left in love with Begonia ‘Glowing Embers’. It’s a plant that positively smoulders its way through summer, in no need of re-ignition come autumn. The bronze, prettily veined foliage provides a strong backdrop for the simple tangerine flowers that rain down all summer like sparks from a welder’s gun.